The Shabby Stamper: Frankie & Friends treat boxes! I got the tutorial for these darling little treat boxes from the creative genius herself, Gretchen Barron. Go here for the tutorial. 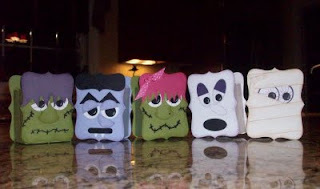 These treat boxes are amazingly cute and really fun to make! I'm going away for the weekend before Halloween with a bunch of old summer camp friends and their kids. It's a rough & ready sort of weekend and a friend of mine always busts out her creative juices and has arts and crafts for the kids to do. This year, I thought that I'd take a project for them to work on, too! There's always a pinata, so I thought that the kids could use Frankie & Friends to put their loot in. How cute, and what a great idea for the kids. I so miss our outings when the kids were little and everything was so exciting and new to them. But then I love it know when we sit around the dinner table and talk about "remember when." You are creating some fabulous memories for these children! !